It was a warm spring night on April 5, 2009. I had taken a four hour drive from a small town in Mesquite to arrive at my destination. Excitement and anticipation filled my very being. I took my seat up in the rafters in the Reliant Astrodome in Houston, Texas, and as I looked down from where I sat, the reality of what was happening finally came to me. I was attending my first WrestleMania. It was a truly magical moment for me, and something I never thought would happen. But the moment Houston was announced as the site for WrestleMania 25, in my home state, I knew I had to go, no matter what, buying tickets as soon as they got out. It was truly an amazing experience for me, and I loved every second of it. No matter what anyone else said about the event, WrestleMania 25 will always be one of the greatest nights of my life. But as I sat down in my seat, enjoying the grand event and all of its splendor, a match was announced as coming up next. It was one of the most hyped matches on the card, and my excitement was growing by the second. I was expecting this match to be one pretty damn good match that went along with what I experienced before it. What I got was one of the greatest and most magical experiences I ever had as a wrestling fan. 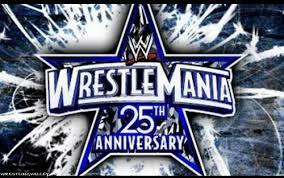 What I got was the sole reason that WrestleMania 25 became, to me, one of the greatest nights of my life. What I got was Shawn Michaels versus The Undertaker. Now when I attended WrestleMania 25, it was before I became a "Internet fan." I didn't know of the IWC, their immense love of several wrestlers and hatred for others, nor of their disdain of certain problems with the company. I was, at the time, just a casual wrestling fan who wanted to enjoy the event. But even I knew I was watching greatness when Shawn Michaels and The Undertaker did battle in that very ring. In one corner you had the Showstopper, the Main Event, the Icon, the Heartbreak Kid, Mr. WrestleMania himself, Shawn Michaels. The best in-ring performer that this business had ever seen. In the other corner you had the Deadman, the Last Outlaw, the Lord of Darkness, the Phenom, The Undertaker. The man who was undefeated at WrestleMania, a staggering 16-0. It didn't get any bigger than that, especially for WrestleMania. And from their contrasting Heaven and Hell entrances to the climactic ending, everything about HBK/Taker was just magic. As I watched the match progress, my excitement, suspense and disbelief grew as I witnessed two legends wage war in that very ring. Then the Undertaker took his signature WrestleMania dive at Michaels, only to have one of the nastiest crash-and-burns I had ever seen. I had risen out of my seat, in disbelief at what just happened. And soon Michaels and the referee were back in the ring, and the referee began to count. I could not believe what I was seeing, and neither could everyone else. I urged Taker to get up, not wanting this great match to end a count-out, and as the count neared 10, it seemed more and more likely. I was on the edge of my seat, screaming for Taker to get back in. And just before the 10 count, he slid back in! I roared with a great cheer, overjoyed that it did not end that way. With one simple count, these two managed to evoke an emotion that we rarely feel. These two men made you believe that this match was really going to end the way it nearly did, and told a phenomenal story through it. The match continued, and I watched as these two men delivered their signature moves to one another, every single one failing to get a three. Every time a two count was made, I felt more and more suspense fill my being. I was literally holding my breath. Then Michaels tries to skin the cat, but Taker catches him and hits him with the Tombstone! It's over! It has got to be over! No one kicks out of the Tombstone! One! Two! Thr-NO! KICK OUT! The Reliant Astrodome blew the roof off as surprise, shock and disbelief overcame me. I could not believe what I just saw. Michaels kicked out of the Tombstone Piledriver! Undertaker's face was one of disbelief, and I couldn't blame him. That was supposed to be impossible. It was at that time that I began to wonder if Michaels could really do it. Could he really do what 17 others before could not? Could he defeat The Undertaker at WrestleMania? Is he going to really break the streak? Moments later, Michaels hits Sweet Chin Music! I can't believe it! HBK did it! He actually did it! I could not believe what I just saw! Taker kicked out of Sweet Chin Music! This is unreal! What the hell was it going to take for either of these men to win? I knew at that moment I was witnessing history, and live no less. I was witnessing a classic that people would talk about for years to come! Not too long after, Taker beautifully caught Michaels as he went for a moonsault and delivered a second Tombstone Piledriver. And with that, the greatest match of all time finally came to a close, and Undertaker went 17-0. On one spring night on April 5th, 2009 in the Reliant Astrodome, Michaels and Undertaker created something special: a match that perhaps no one could ever come close to. It's matches like these that remind us why we are wrestling fans, why we watch this product. It was this match that showed why WrestleMania was the grandest stage of them all, the show of shows, the Super Bowl of professional wrestling. It was a match that truly defined what modern wrestlers should strive for. Never before had I felt what I felt watching this match live and in person in that arena, and I don't think I ever will again. Looking back on that night, I consider it an honor and privilege to be one of the few people who were able to witness that match in person. It truly created an experience I will never forget. I have seen many matches since then, both from the past and what has just happened recently. Austin vs. Bret, Michaels vs. Bret, Punk vs. Cena, Taker vs. HHH, even HBK/Taker II. These were all phenomenal matches, but not one of them came close to giving me the same feeling I had with HBK/Taker I. That is why, ladies and gentlemen, Shawn Michaels versus The Undertaker at WrestleMania 25 is the greatest match of all time. If you have any comments please feel free to comment below.